…and I don’t mean Blues. 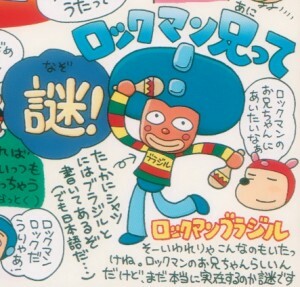 As you can see, I’m talking about Rockman Brazil, the half-baked creation of Rock & Rush manga artist Sakura. Dressed as if he just got done marching in the Mardi Gras parade, Brazil was born when Sakura crossed Rockman with the ganguro fashion and foreign culture fascination that was sweeping Japan’s youth in the 1990s. 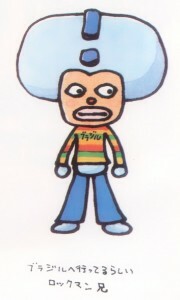 His trademark look includes a colorful horizontal striped shirt, bell bottoms and a ‘fro-shaped helmet, along with the tan-faced white lips of traditional ganguro style. It probably goes without saying that Brazil is not the most racially or culturally sensitive character, but somehow that just fits in perfectly with Sakura’s off-color/socially inappropriate world. Brazil has made a handful of cameos in yonkomas and Capcom Secret Files, but he’s perhaps most famous for his appearance in the one-page comic Rock & Rush World 2 that first appeared in CAP! Vol. 6. There are a lot of rumors going around about this guy I guess. 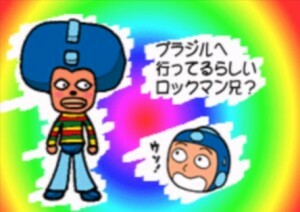 They say he’s supposed to be Rockman’s brother, but the real mystery is whether he even exists at all. I wanna go to Brazil. Rush: I heard that Rockman’s big bro was in Brazil. …I wanna go! Rush: So we took a flight. 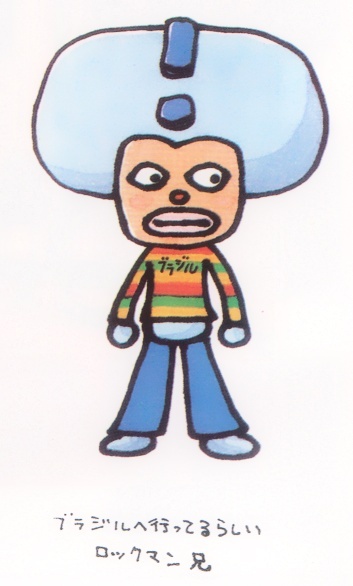 Brazil also made an appearance in the image gallery section of the Database for the Playstation version of Rockman 2. Rockman’s brother who seemingly left for Brazil? Brazil usually winds up with a slightly different color scheme in every appearance. Some say he’s an just urban legend. Others insist he’s actually Rock dressed up for a rave, or to play tricks on people. But does Rockman Brazil really exist? 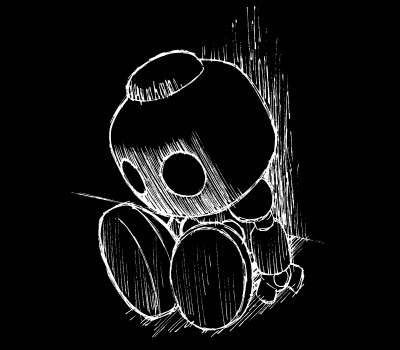 No one knows for sure, and only poor Rush seems to care. 4 Comments to "Rock Brother"
I bet his maracas do massive damage. Although no present in it, does his creation have any relation to the weird Brazilian comic “Novas Aventuras de Mega Man”? That’d be pretty funny if it did.